I’d like to preface this case study by stating that my intentions behind redesigning Apple Music were in no way driven by indignation or spite. Earlier this year I applied and interviewed for a graphic design internship at Apple Music (an opportunity of a lifetime), and was turned down with a very kind letter stating that although they liked my work, they wanted to see more growth and training. …but as soon as I came to this realization, I became inspired to embark on what became a a three-month long journey to the holy grail — the iOS app that Apple Music deserves. What you’ll find below is a case study offering potential solutions to address some of Apple Music’s problems, as well as ideas for future development. My process was guided by qualitative user research, Apple’s official Design Principles, and my own designer intuition. As a designer with a background in music composition and performance, I have always been passionate about experiences that marry music and technology. Through design, I hope to one day make the experience of music more accessible and enjoyable. However, Apple Music has always frustrated me. 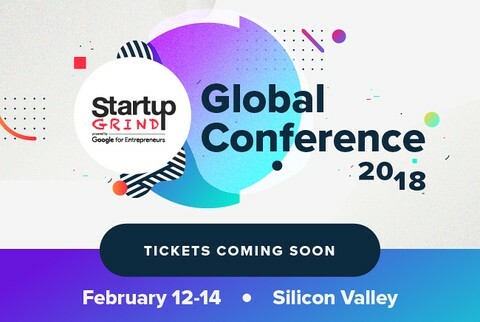 What was meant to be the service to convert everyone in the world to streaming is going through puberty — a phrase which here means steadily maturing yet unattractive compared to the adults in the game (aka Spotify). 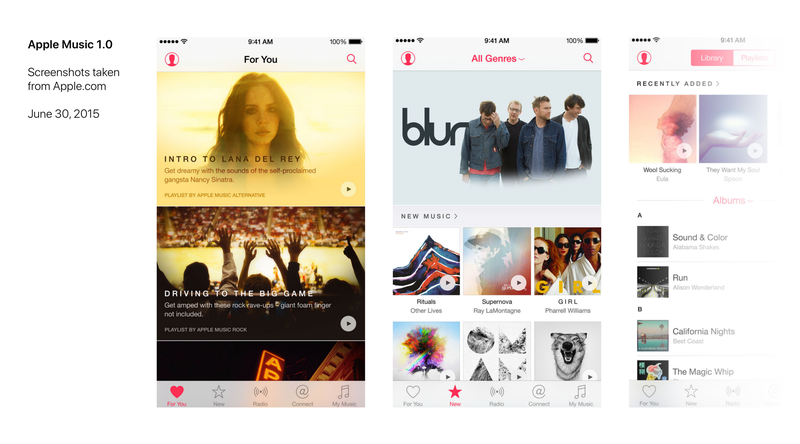 To better understand Apple Music, I took a trip down memory lane and revisited its inception. 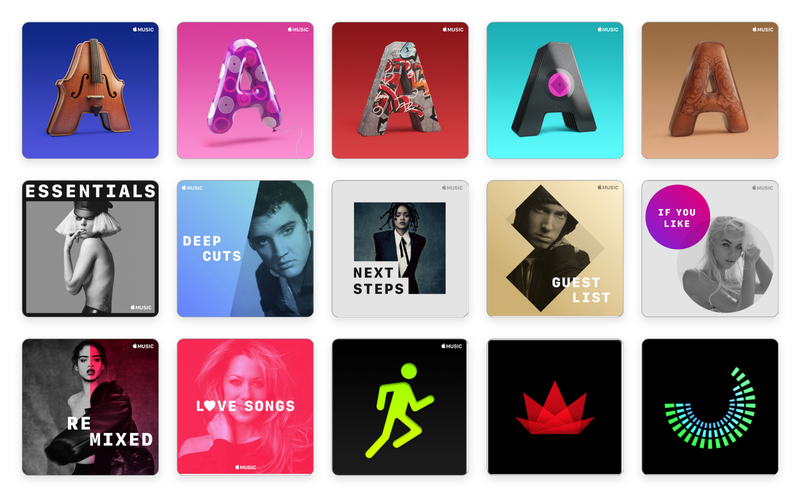 Plagued with a notoriously confusing interface and a half-baked visual identity, Apple Music’s first identity was the culprit of many headaches. With iOS10, Apple released a much-needed update based on the principles of Complexion Reduction. While this new interface was much easier to navigate, I still felt that there was room for improvement. Despite its simplified color palette and enlarged typography, the interface felt cluttered and even claustrophobic — a far cry from Apple’s usual elegance. If you hear something you like, add it to your library. 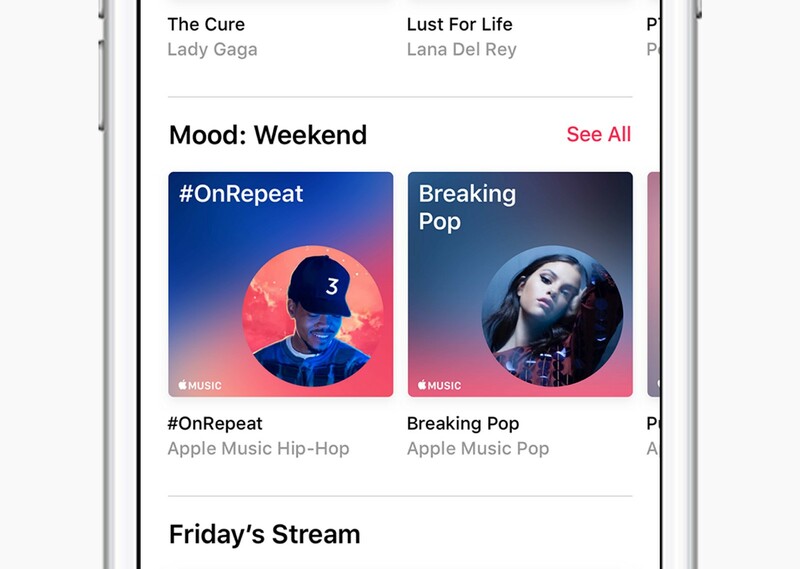 Treating playlists as tools to discover new music is an approach that makes sense given Apple Music’s pastlife as iTunes. However, the way that playlists are currently implemented feels very tacked on. I found that users weren’t comfortable with adding entire playlists to their personal libraries, especially if said playlists were constantly updating. My Sampler is a new experience made to bridge the gap between Hoarders and Nomads, replacing the current “New Music Mix.” It was born out of the understanding that users who are picky about what goes into their library would also be more reluctant to sit through an entire playlist full of new music. A better experience would be presenting snippets — or samples — of curations that gives the user just enough information to decide whether or not to add it into their library and weekly playlist. Upon entering the Sampler, the user is presented with a series of artist headshots that correspond to a curated song. 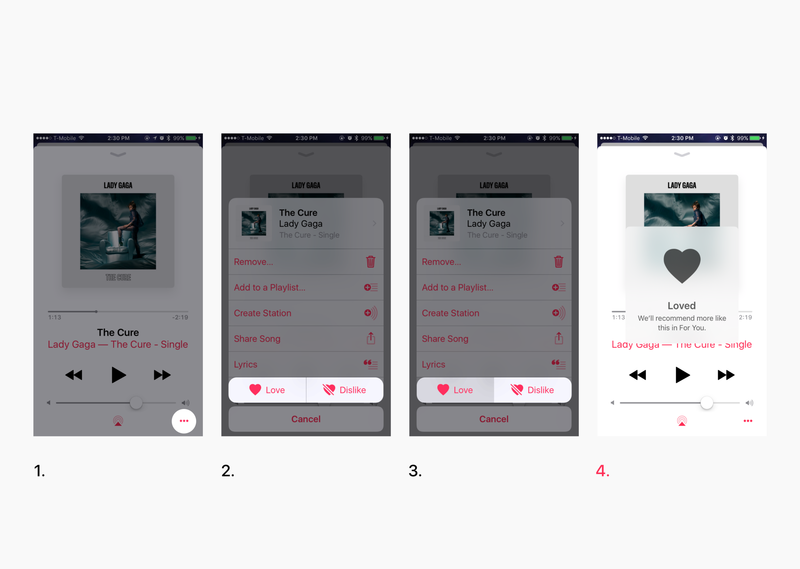 The user can tap and hold to preview 15 seconds of each song, before swiping up to reject the song or swiping down to add the song to their library. I chose to use gestural interaction so that users can use the Sampler even if they’re not looking at the screen. Once the user has finished sampling, their selections are used to create a New Music Mix that the user can listen to. I have come to understand that, through a gamified experience, the user is able to establish an immediate connection to the music they discover. 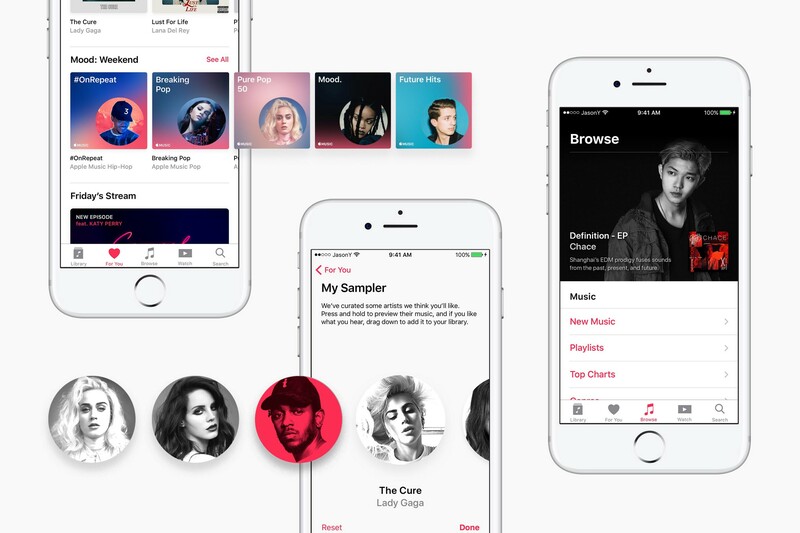 In addition, the Sampler has the potential to provide Apple Music a constant stream of information regarding listener preferences, allowing the app to evolve and grow with the user. 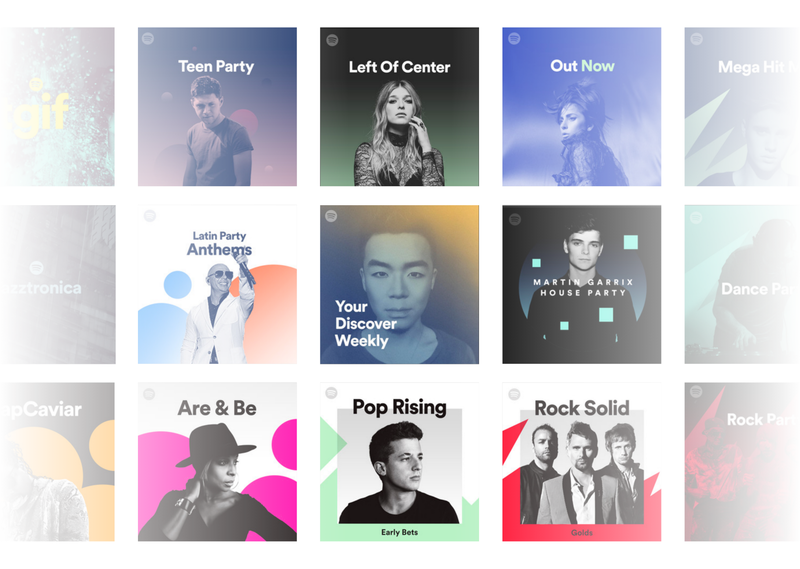 During my internship at Sony Music, I learned that a brand’s visual presence in a streaming service must be recognizable yet invisible at the same time. Spotify does this very well in their use of halftone photography and “Bursts” in their playlist album artwork. There’s a mix of symbols, 3D typography, and black & white photography. In addition, there are collage-themed covers that don’t really communicate anything about the mood/feel of the playlist. The main issue seems to be Apple Music throwing everything at the wall to see what sticks, instead of really developing a consistent visual language that signifies Apple’s presence in the app amongst a sea of album artwork. Album Artwork should be treated as part of the UI, and not a stand-alone visual component. Inspired by Apple Music’s Welcome Screen, I chose to showcase artist headshots within a circular motif. The circle shape was inspired by the iPod clickwheel — an iconic part of Apple’s music legacy. The “face inside a circle” motif is also seen other aspects of iOS, most notably Contacts. 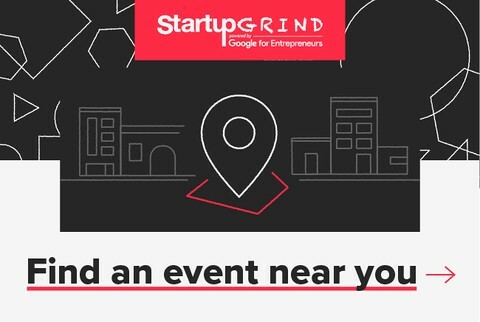 In addition, I chose San Francisco so that the Artist Spotlight artwork would harmonize with the UI. Lastly, I limited the color palette to different shades/tones of blue, violet, and red to reflect the Apple Music Icon. For Curated Playlists, I wanted the look to be consistent with Artist Spotlights while showcasing an aspect of the playlist’s mood/vibe through use of color. More vibrant images are displayed against a backdrop of the same image with a gaussian blur filter (inspired by iOS’s background blurs). 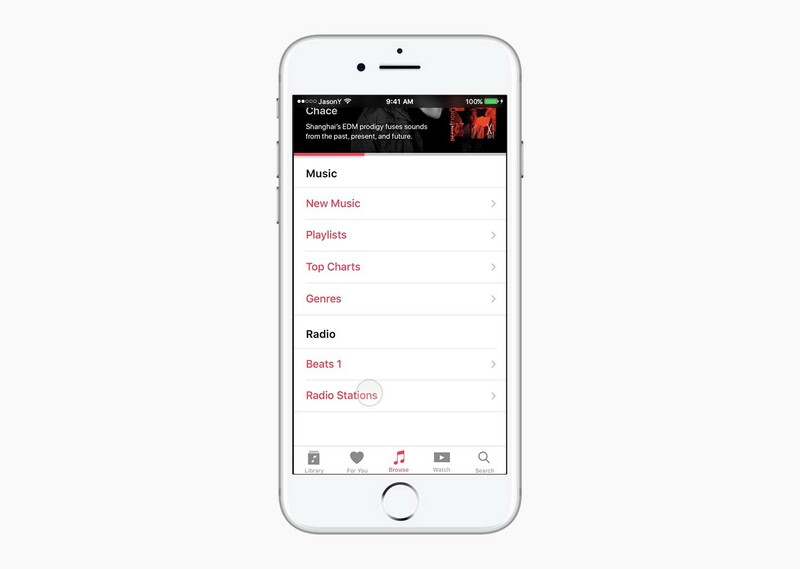 For certain covers, I also added a subtle gradient of Apple Music’s signature red to add a sense of dimension. Finally, I updated the centered graphics for some of the core playlists with the same typography used for the Artist Spotlights and Curations. I didn’t think major alterations to the Library tab were necessary, so I limited the changes to the standard white space and typesize adjustments. I removed Downloaded Music as a default menu option because I think the app should self-adjust what music the user is able to access based on the availability of LTE/WiFi. Below are some subtle animation details (present in all tabs) I added to make the app feel less sterile. The round corners of the app already make it look bouncy, why not make it feel bouncy as well? 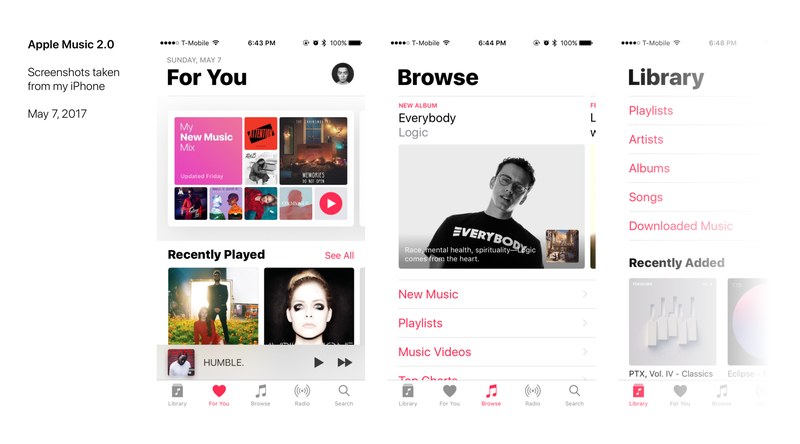 The redesigned “For You” begins with “My Sampler” in lieu of the current “My Favorites Mix” and “My New Music Mix”. “Recently Played” is kept intact, as users found it to be quite useful. 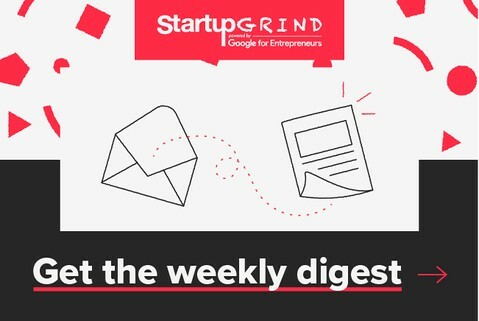 Scrolling down, you’ll find that I’ve changed the “Insert Day of the Week Here — Playlists” to a specific Mood that will adjust based on location, time, and recent social media activity. 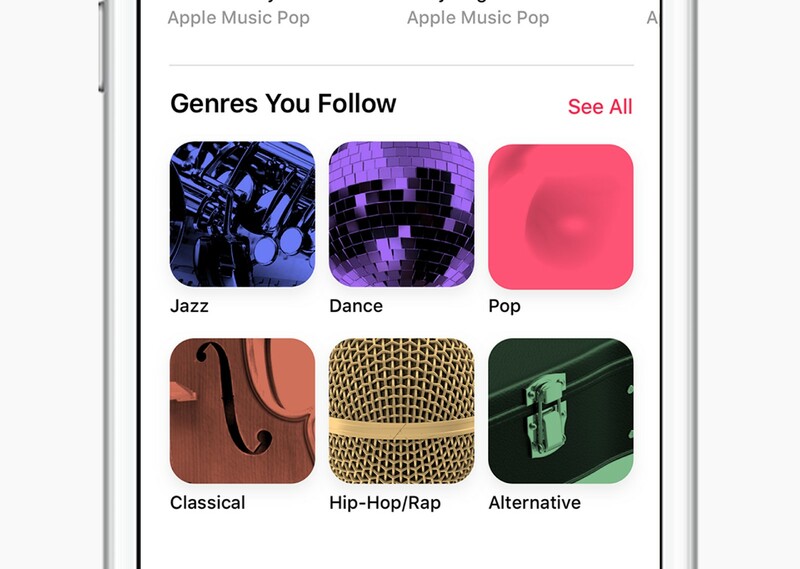 Wouldn’t it be awesome if, immediately after checking into a café on Facebook, Apple Music updates this Mood section to Focus/Study playlists? If we’re sharing our entire lives on social media anyway, might as well get something out of it, you feel? Below that is the Daily Stream, an example of how exclusive video content can be pushed to the user based on their preferences. For example, I really like Katy Perry, so if a Katy Perry episode of Carpool Karaoke is released, the Call-To-Action can be changed to place the emphasis on Katy’s appearance. This hasn’t technically been released yet but please let this be true. Afterwards, you’ll find the classic Artist Spotlights, which I kept in this demo to show how the new visual branding schemes works in harmony with the rest of the UI. 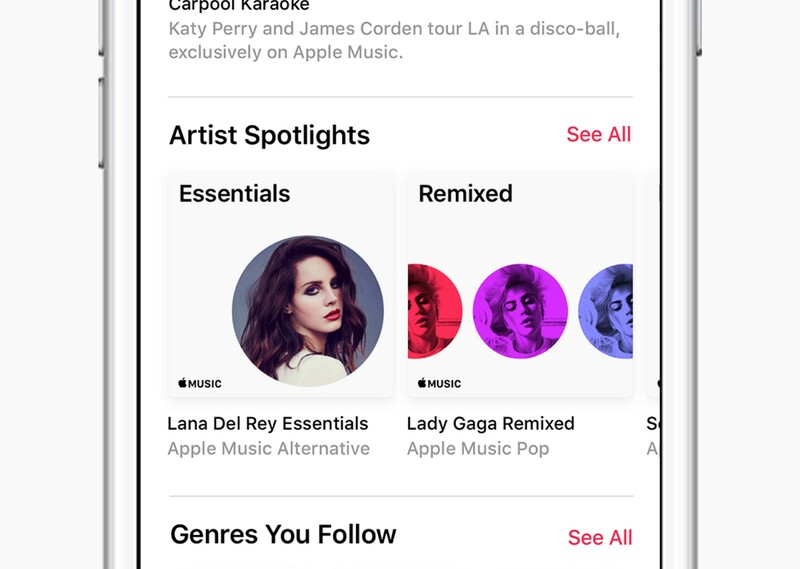 And last but not least, users get a preview of their most-loved/played genres so that they have quick access to more music if nothing in the For You feed was able to pique their interest. 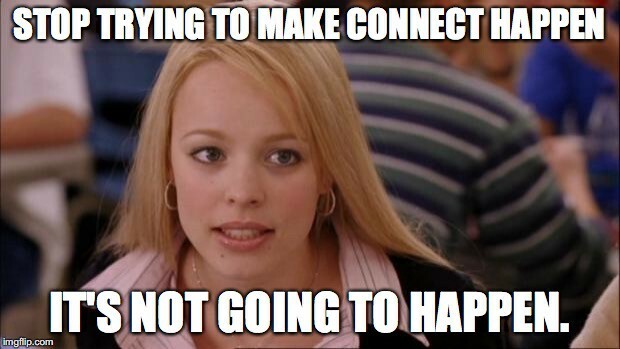 But whatever happened to Connect? Good question. Truth is, I didn’t see any data from my research that would justify keeping the Connect feed in the app as is. Users were more interested in connecting with friends and family through music (a la Spotify) instead of with artists through a watered-down Twitter. 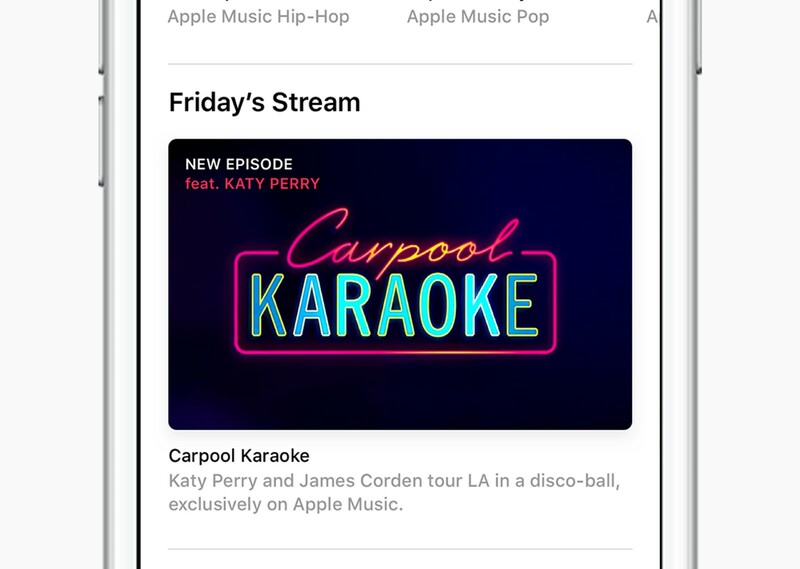 I think Apple should focus on integrating existing social media with Apple Music instead of trying to push yet another one on its already overburdened consumers. My solution was to redesign the Feature Slides in the style of Apple’s Website — Jumbo slides that fill the viewport width, with a horizontal indicator of where the user is in the slideshow. I believe this change makes Featured content feel more inviting and less intrusive/random. I also merged the Radio menu into the existing Browse menu. 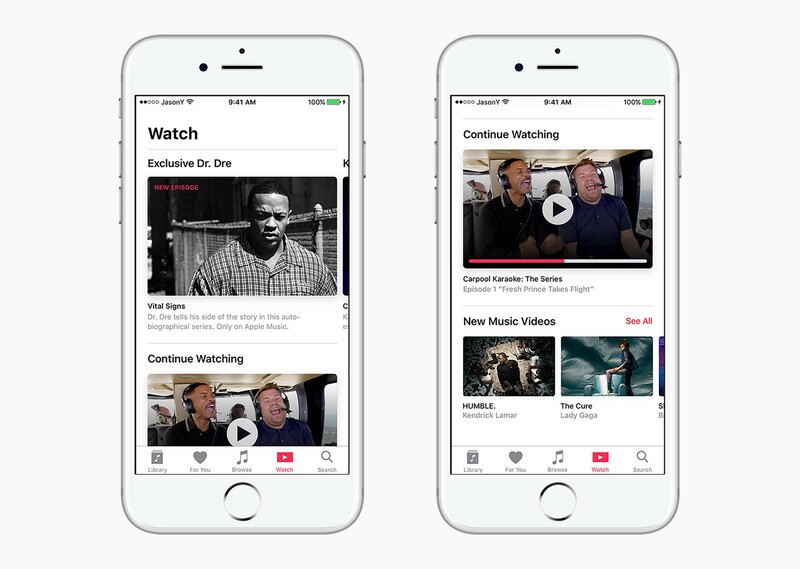 Earlier this year, Apple confirmed that Apple Music was expanding into video streaming content in an effort to turn Apple Music into a pop-culture central. I was curious how this will play out especially in the context of the mobile app, so I created a separate tab specifically for browsing exclusive video content and music videos. An added bonus of dedicating a tab to Video is that “Browse” can be reserved exclusively for audio content. 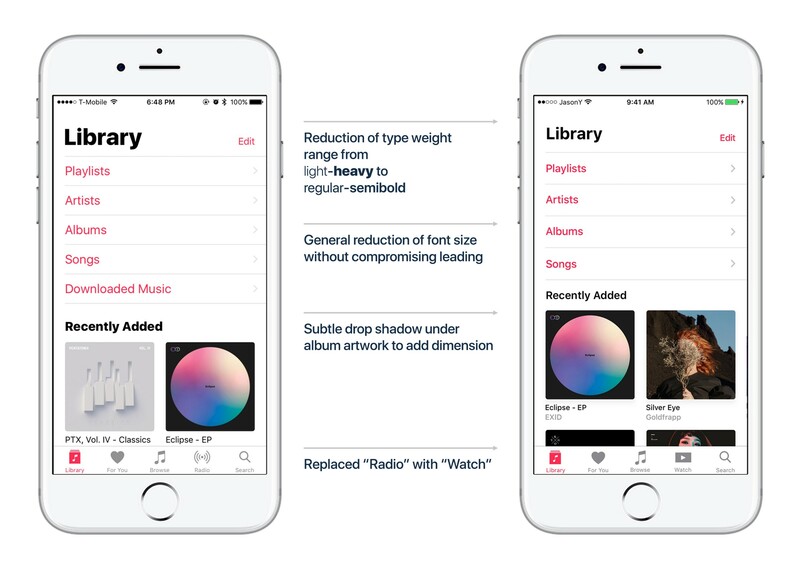 There will eventually be enough content to justify a dedicated tab, but for now I based my design decisions on leaked information as well as Apple Music’s existing visual language. 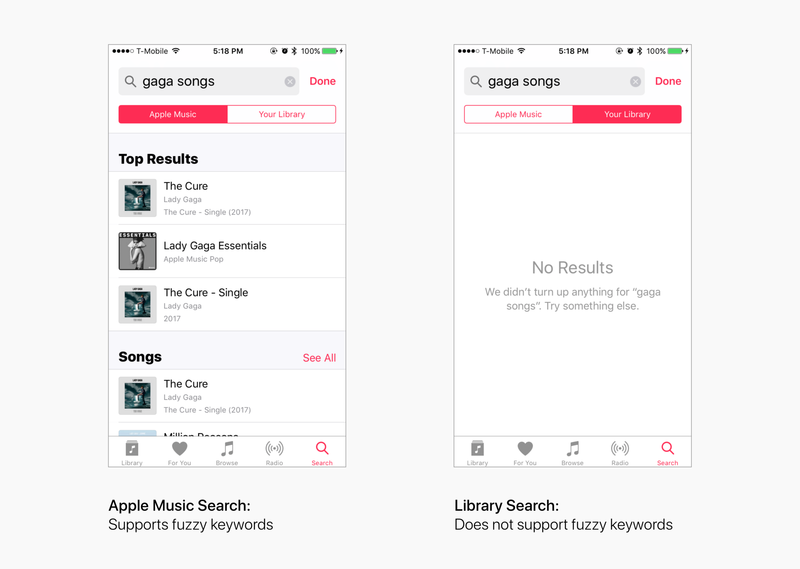 The main problem with how Apple Music handles search right now is that it is based on a mode system: where you can either search in Apple Music or your library — but not both. This is especially annoying because there’s a high potential for input error, especially if the user is looking up a new song or artist not yet in their library. 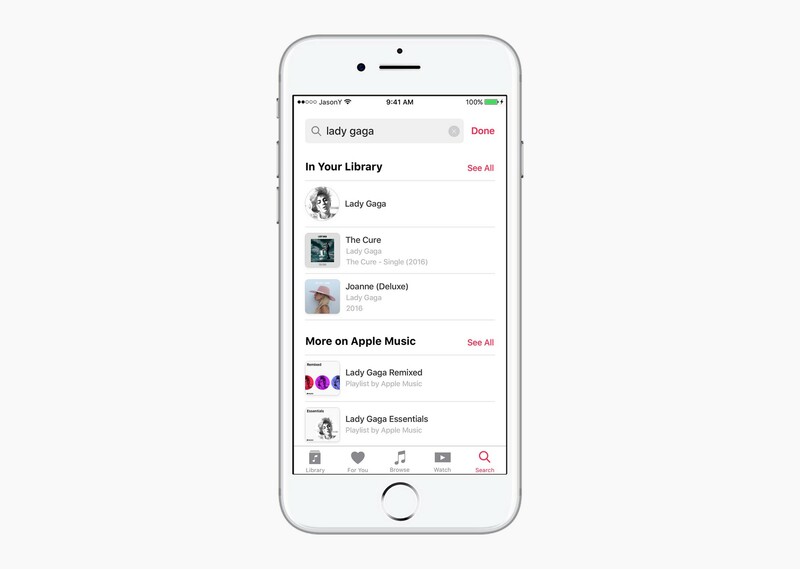 My solution was to merge the two modes into one general “search” that displays results from the user’s library first, followed by anything else that is available on Apple Music. Is it obvious that I’m a huge fan of Lady Gaga? Support for fuzzy keywords should extend to the user’s Library content. It will also be interesting to see if results for keywords relating to moods or activities can be implemented in the future. I like what Apple has done with the Now Playing screen, and didn’t think any major adjustments were necessary. I decided to keep most of the visual interface as is. However, I thought a great way to build upon the existing experience would be to incorporate some simple gesture interactions. To many users, myself included, the necessity of “training” Apple Music through the “Love” and “Dislike” commands was unclear. This can be partially attributed to be how well said commands are hidden; the process of “loving” a song on mobile requires users to open a separate menu — a tedious process that trivializes its impact. My solution was to implement a gesture that most users are already familiar with — the double tap — into the Now Playing experience. I observed that many users tried to press the “floating” album art in the present release (it just looks so delightful)…why not add a response? In addition, I added sneak peeks of adjacent tracks that users can skip to through a horizontal swipe. I believe this will grant users more control over their listening experience in an intuitive way. Looking back at the initial scribbles I made on my notebook during my initial brainstorming sessions, I’m happily surprised at the amount of progress I was able to make in three months. Going into this process, I had no working knowledge of Principle and could barely edit blend modes in Sketch. Now…to be honest, I still consider myself a novice in said prototyping apps, but hey, I was able to make something happen — and that’s the best I could have hoped for. I don’t expect the good folks at Apple Music to take anything from this case study. In fact, I might actually have a heart attack if anyone working on Apple Music stumbles upon this article… but if you’re out there, I hope my work was able to give you some ideas and spark some conversations! Through this project, I have come to understand the value of my theatre background in relation to UX design — experience designers and theatre artists are alike in their shared understanding of human empathy. Take that, literally everyone who rolls their eyes at my resume! Soon, I will be embarking on my next great adventure: BFA Graphic Design at Rhode Island School of Design. Although it feels strange to say goodbye to this process (and to Northwestern University), I sincerely hope that this is just the beginning of a career in experience design… a career of changing the world through empathy. Twitter | Instagram | Portfolio | Let’s talk!